Think I’m being hyperbolic? 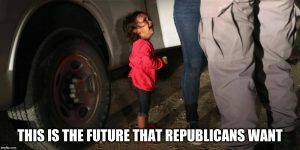 Every single Democrat in the Senate has committed to a bill which would stop the separation of children from asylum seekers; not one Republican has joined them. Rolling Stone on Monday reached out to 11 prominent GOP lawmakers in Congress who had not yet condemned the Trump administration’s “zero-tolerance” directive toward undocumented immigrants that has yielded this horrific outcome. The lawmakers on that list include Senate Majority Leader Mitch McConnell (R-KY), Sens. Ted Cruz (R-TX), Lindsey Graham (R-SC) and Jeff Flake (R-AZ), and House Majority Whip Steve Scalise (R-LA). Not a single Republican currently in Congress contacted by Rolling Stone responded to questions about their position on the practice of dividing immigrant families, an indication of just how intractable the issue of immigration has become for the party. Susan Collins is considered a moderate Republican, unafraid to vote against the government and her party if her conscious says otherwise. When it comes to this issue, though, she’s defended the government, and only under intense criticism has started questioning what they’re doing and come around to condemning it (but with strings attached). Some other Republicans are joining her (that Rolling Stone article has been corrected to say Ted Cruz is taking action), but not because they’re legitimately worried of the welfare of these kids; nope, they’re worried the optics of the situation could cost them reelection. The UN Human Rights commissioner says “inflicting such abuse on children is unconscionable?” No biggie. The President of the American Association of Pediatrics calls it “government-sanctioned child abuse?” Whatever. But suburban women voters are getting angry about the issue? Time to make a statement! Maybe. 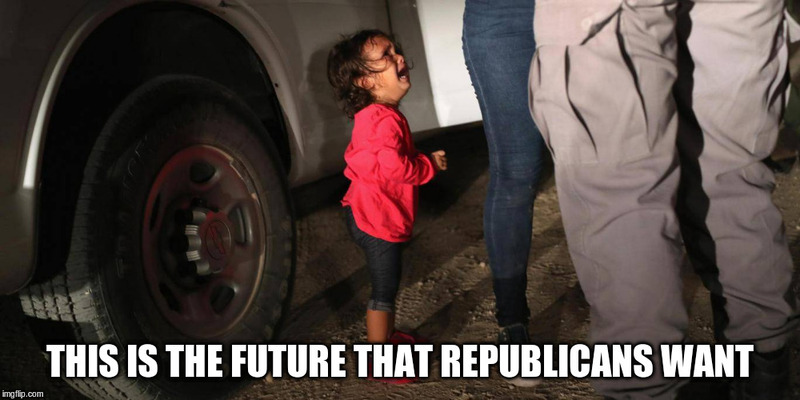 But until they come around to condemning the forced separation of children from their parents, I have good reason to think that Republicans are cruel and promote inhumane policies. If you have an ounce of empathy, don’t vote them into office.